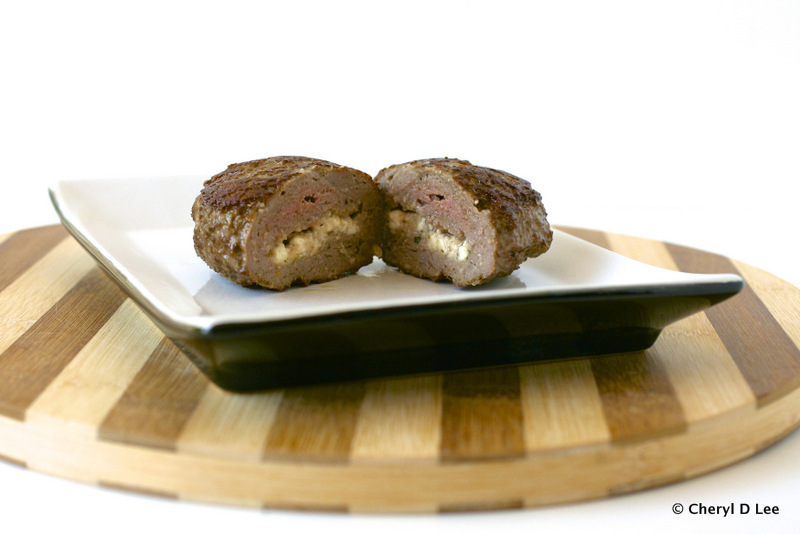 Feta Stuffed Lamb and Beef Burgers, sizzling on your grill or broiling in your oven. Can’t you just smell them and taste them? The burgers are flavor bombs, the lamb and beef seasoned with complex shwarma seasoning, with the salty pop of feta cheese in the middle. 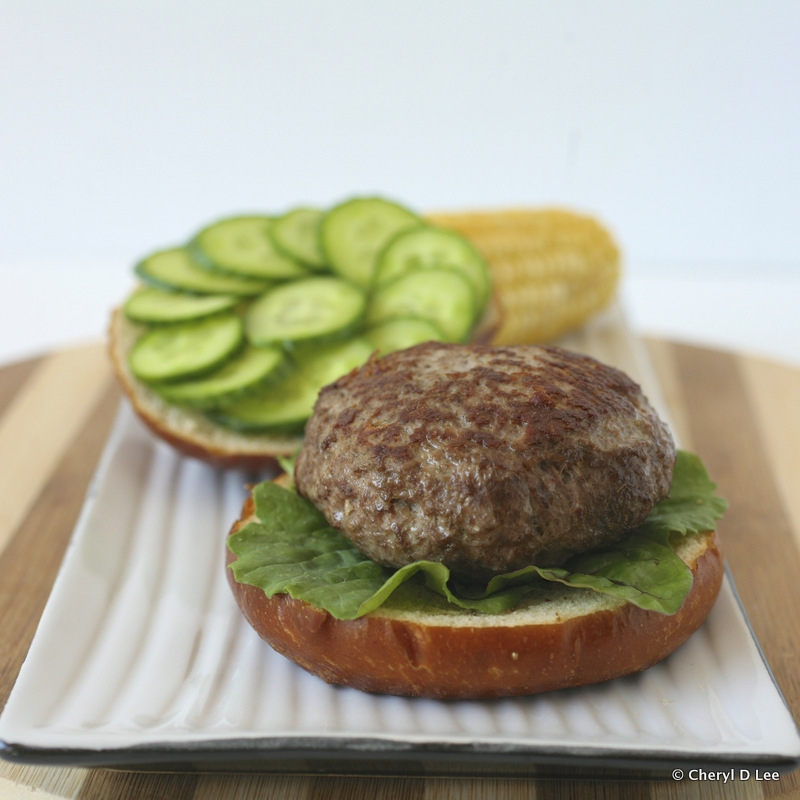 These burgers are a 50/50 blend of ground leg of lamb and grass fed organic ground beef. Unbeknownst to me, my grocery store had a special on ground lamb going, so they were sold out. But because they have real butchers onsite, one was kind enough to grind a nice piece of boneless leg of lamb for me. And it was on sale for the same price, so it was a total win! You can use all lamb or all beef depending on your tastes. Just be sure to use a good Schwarma seasoning mix, such as Sadaf. The Mediterranean herb feta used in this recipe is commonly found in grocery stores, but if you can only find plain feta, then use that. In a medium bowl place the beef, lamb, Schwarma seasoning and salt. Gently mix the ingredients together, making sure to distribute all the spices. Divide the ground meat into 5 approximately six ounce portions. Split one six-ounce portion in half, and flatten each piece. Place 1 teaspoon crumbled feta onto the flattened piece. 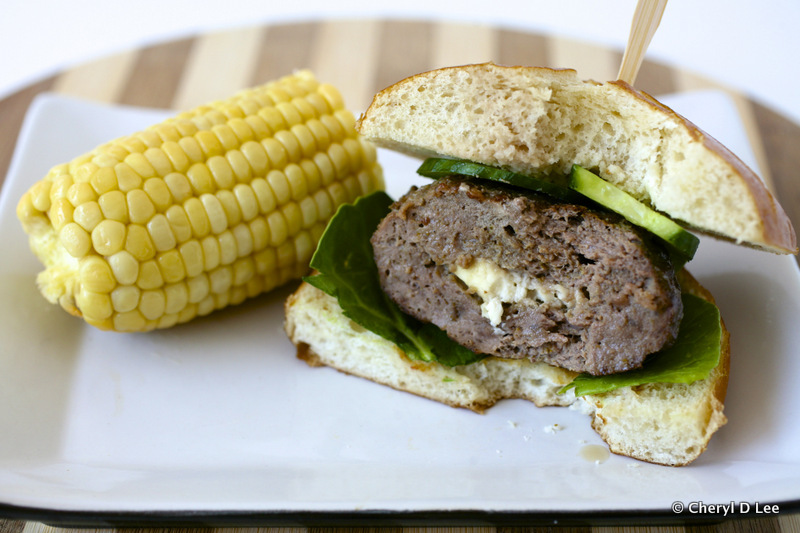 Cover the feta with the other half of the meat, press on the edges to seal, molding in your hand to form a patty. Repeat with the remaining portions of seasoned meat. Place the burgers on a parchment or foil lined baking sheet and chill in the refrigerator for at least an hour to overnight. Heat the oven to 350 °. In a large skillet, heat the oil over high heat. Place the burgers into the oven safe skillet, cook 4 - 5 minutes to brown the patty. Flip each patty, then place the skillet into the oven. Cook the burgers 12 -15 minutes or until cooked through. Shwarma seasoning can be found in the Middle Eastern or Kosher section of your market. If you cannot find it, you can also order from Amazon. Offer lettuce, sliced cucumber, sliced tomato, sliced onion, hummus or Greek yogurt with Schwarma seasoning mixed in to garnish these flavorful burgers. I am so glad you enjoyed them, although I am not sure where the cornflour taste you are referring to came from. The one possibility may be your shwarma seasoning, as they are not all the same. Try a different brand next time, and see if that makes a difference. The photos looked amazing and I happened to come across good quality bread so there it was! I decided to make this recipe. This is the first one I tried from your website and very rarely do we find time to say thank you…..so this is a message to say thank you! We loved it and I pigged out on two burgers. Just one question – how to avoid the cornflour taste…i mean, how do i know the tikkis are cooked from within, else the powder taste comes through…I kept it on the pan for a longer time anyway….but would like it to be perfect next time!!!!!!!!!!!!!!!!!!! !